The mother-child relationship has always carried a lot of weight. Now researchers say some obese teens might be in essence, carrying the weight of their relationship with their mothers when they were younger. A new study published in this week's edition of Pediatrics finds the type of relationship a mother has with her young child could affect that little one's chances of becoming obese as a teen. Researchers looked at data of 977 children from around the United States, which documents relationship characteristics between mothers and their toddlers. The less of an emotional bond a mother had with her child, the higher the risk that the child would become obese by the age of 15. When analyzing the data, investigators found 241 children or more than one-quarter of all toddlers who had poor emotional relationships with their mothers were obese as teens, compared to adolescents who were close to their moms at 13 percent. The researchers at Ohio State University found that this new study actually supports previous research by the group, which shows toddlers who did not have a secure emotional relationship with their parents had an increased risk of becoming obese by the age of 4½. Knowing both of these points, researchers say both studies suggest the areas of the brain that control emotions and stress, along with appetite and energy balance, could be working together to influence the likelihood that a child will be obese. Investigators did say instead of just blaming the mother for her child's obesity, efforts should be made to improve strategies to improve mother-child relationships earlier in a youngster's life, and not just focus on the child's eating habits or exercise. Anderson also says, "the sensitivity a mother displays in interacting with her child may be influenced by factors she can't necessarily control. Society-wise, we need to think about how we can support better-quality maternal-child relationships because that could have an impact on child health." But nnt their father? Could it be that children with "strong relationships" with their mother spend less time sitting still? Define strong relationship. Who funded this study? It appears that abusive/absent fathers are getting a "pass" on this story, which in all the media reports I've seen is opening a new door on the term "refrigerator mother" (associated w/autism). It does take the two of them–absent modern technologies and adoption laws–to, one way or another, make a kid feel miserable. I could say much much more, but I won't. The food industry feeds the poor like cattle, fatten them up.. Than big pharma takes over to give them drugs to loose weight or lower their blood pressure.. The Standard American diet is loaded with fat, sugar, calories, artificial ingridents.. Cheap processed food makes more money than fresh fruits and veggies. Yes, people need to be educated to make better decisions..
Bobby, you are damn right !! no one wants to spend the time to cook nutritious meals. people want to take the easy way out and it shows in the muffin tops alot of people have. It's all about greed with no concern for the health of the population. Commodity crops, industrial farming, big pharm and the diet industry have the country right where they want us all; not just the poor. Didn't they do this in Rome? The people at the top or the 1 % looking down on us saying feed them and entertain them and we can have our ways with them? 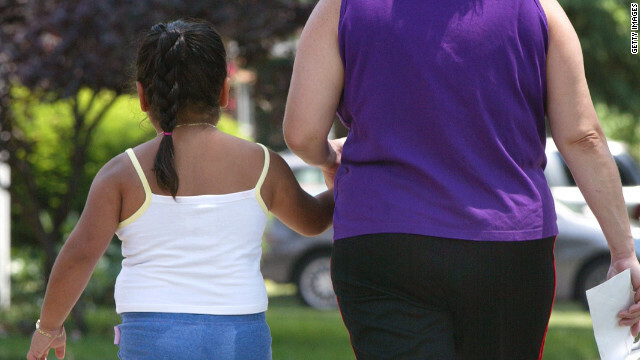 This article will make moms with overweight children feel so much better! Leave it to CNN to put out something that blames parents for everything wrong with kids. Who else's fault would it be? There are a lot of other people who could be at fault! First hand, my granddaughter has – I know where it comes from – the father's side of the family. \My daughter is no longer with the father and has no control of what happens when she goes to his house even though she has tried to talk to them. They are overweight, fry everything and the drama in the house is ridiculous – enough to make an adult go nuts, let alone a 6 year old! Unfortunately being overweight "runs" in the family but no one has broken the cycle ... they are just passing it down. but at the same time. Mothers or Mamas now-a-days don't exercise, which in turn shows the kid(s) to not exercise as well. Regardless of whether it's a mom or a dad, the blame can be placed on the live-in baby-sitter, the TV, that either parent uses to keep from parenting. My doctor said my weight problem was due to my glands: they weighed 200 pounds. My mom is obese and our emotional connection is poor. She actually verbally and physically abused all of her children. However, I have always worked on not becoming like her and have kept myself healthy in many levels. Including my weight. On the other hand, my three brothers are obese. "MAY be blamed." Another BS study.. why do people believe this crap. So, Katie, you think that most obese children are just naturally obese? You actually think parenting habits have nothing to do with a child's weight/eating habits? Do the world a favor and do not become a mother. My mother and I never had a relationship. I was an obese teenager, then went up and down with my weight. I attempted to commit suicide twice in my later years because of my controlling mother. Moved away and that helped and I got my weight down. However, she ended up living with me as she got older. Back up I went. I know after she passes, I will feel better and be able to lose the weight. My relationship with my children is excellent. I knew what not to do to destroy the bond. They are all thin !!!! Yes, I believe that relationships can have an impact on your weight your entire life! I agree 100%. Had a horrible relationship with my mother and still fighting the weight. I totally agree with you. Similar experience for me. Nowhere in this article I saw mentioned if they controlled for economic status of a family. It is likely hard to have a good emotional connection with a child of any age if you have to work multiple jobs/extra long hours and the child is left with someone else for inordinate amount of time. When you are a well-paid professional, you can compensate for it by outsourcing domestic tasks, but this is not an option available to a low income mother. The constantly exhausted emotional state that goes with it probably does not help either. And it has been shown multiple times before that poverty greatly increases chances for obesity. So is there a really new observation here or are we seeing just another facet of the same phenomenon? Let's make poor, struggling mothers feel bad about themselves by suggesting that they make their children fat... by being emotionally disengaged. I wonder who funded the study. I also have to agree with other commenters that complete neglect of the father's contribution is misogynistic at best and unscientific at worst. I was thinking the exact same thing as I read this article. Exactly what I was thinking. And watch, their solution will be 'classes' for mothers to take to learn how to more effectively manage their 'love and nurturing' time when what they really need is MONEY. Money to be able to pay the bills, daycare, rent etc...so they don't have to work 8 part time jobs just to watch their kids be raised in a crappy daycare. ALL MOTHERS WANT TO LOVE AND NURTURE THEIR KIDS. Our society only cares if they are working outside the home. My mom is so fat her memory-foam mattress developed Alzheimers. Go to the freaking gym people, being fat is not attractive.. Save your lazy excuses for pepole gullable enough to listen. People are actually paid to study this BS? No wonder their conclusions are also BS. What is the percentage of obese kids to the number of parents who told them, "No, you can NOT have another piece of cake for dinner"? People are paid to study this "BS" so maybe somebody can pinpoint the problem and try to come up with a solution you morons. This is absolutely ridiculous. So the teenage girls that starve themselves or are bulimic and cut on themselves obviously have strong, healthy relationships with their mothers. This study is Fundamentally flawed. We have evidence that proves otherwise. Nice try though. Clearly, you know very little about research. It's nice that you learned such an erudite phrase as "fudamentally flawed", though. One can cite all the special cases that contradict a finding he or she likes, but that doesn't change the data or the finding. Go read the paper and tell us what this "flaw" is. Whether or not the correlation is meaningful (or in keeping with your previously (and closed-mindedly) held opinion), also does not negate the correlation. If you don't like the outcome of the study reported in an article, dig deeper and share your findings with the world. Otherwise, you're just spouting off. Not only that, but fattening foods appease hunger more than healthy fiberous ones, I dont care what the doctors are trying to tell us. Fiber gets alot of us more hungry. People are fat because we are UNHAPPY. Can anyone fix that? or can we fix it with a PILL that gets us fatter? Kids are fat because we CANNOT let our children out to play as much as we would like because our neighbors are molesters, pedophiles and untrustworthy. Not to be left out: Moms with kids ( as dads werent mentioned in this article) do not make the best money to be able to afford and shop for "healthy" foods. stoopid study. what about anorexics... where do they fit in? how did moms f them up? and where is daddy? where, oh, where, is Daddy? the protector, the provider, the kindest man a little girl could meet? Figure out how to help us be happy. You can solve the obesity problem that way. Natalie, I was commenting on this just the other day... Many of us have fond memories of going to our grandparents' house when we were kids and spending time with them. But, with families so spread apart and grandparents working to make ends meet, our children don't have that same experience. That means greater pressure on Mom and Dad than I think families experienced in the past. It's sad for our children in many ways. I know I eat because I am unhappy! I skyrocketed to 305 lbs after my husband lost his job. I couldn't cope, I didn't know how to cope! So I ate. We're still struggling and I'm still unhappy but I'm trying hard to lose the weight. 61 lbs so far, but this past week or two has been the hardest. Fat people are lazy. Very few of them can actually blame medical conditions for their obesity. Working out is hard. Eating right isn't always satisfying. It takes effort to be in shape. So what? Individuals are responsible for the shape of their bodies the vast majority of the time. But in the case of parenting, it's the parents fault. Learn how to keep your kids healthy. It's not actually that hard, unless you're lazy. If you care enough, you will always find the time and energy to take care of your children properly. Bullcrap. Although some of what you say is correct – there is hereditary problems and medical problems that ARE a factor. There are some people on medication they must have that will increase your weight no matter what you do – like people on Prednisone or pain medications. There are those who are divorced and have no control over what the other parent or care giver does with food. There is the food industry craming down your face false ads, the government changing the food pryamid whenever they get a chance. It's no wonder people are confused. There are no excuses for some people – yes some are lazy, but unless you live in their "shoes" you have absolutely no way to know what is going on with that person! For that matter, how do you know they aren't trying to eat right and exercise – you don't become "thin" overnight! What about dad? Maybe if he would pay the bills so mom could stay home, then the mom could actually do her job. Why do the guys always get a free pass? agree. at least one parent should be abel to stay home with child.. be it mom or dad. prefer it to be mom. When parents make fattening food for their children, that is what they learn to eat and what they learn to like, and what they learn to cook/buy. It isn't that coplicated, children learn from their parents. hmm so who is to blame if you become obese as an adult? I love it when I hear the term "runs" in my family. Nothing "runs" in a family. Maybe your fat because no one "runs" in your family. If mom is out of shape, kids will 99% of the time be out of shape. If mom is very fit, somehow the kids live the same lifestyle and join in. If you don't have the money to keep yourself fit as an adult, you should never had had kids in the first place as it's a parents responsibility to raise them healthy, not lazy an fat. Disgraceful. While I like that the study encourages mothers to be more connected with their daughters, I just don't agree with the findings. For one thing, the study should look further into relationships those scale-tipping girls have with their grandparents, especially their grandmothers. If the mother is robbing her daughter of weekend pedicure trips and matching outfits, chances are the daughter is closer to the grandmother. The word 'grandmother' is synonymous with 'secret recipe chocolate cake', 'worlds best cassorole', 'corn muffins', and 'apple pie'. No one can leave their grandmother's house with their jeans buttoned because grandmothers will feed you and feed you more until you beg them to stop. They mean well and they are only doing it because you have been neglected by your own mother, but they can't see that the excessive gross amounts of food they are pushing is the reason cities like San Francisco are banning toys from happy meals. The bottom line is this: when mothers neglect their daughters, the daughters will seek that relationship with their grandmothers and grandmothers are food pushers. Instead of tiptoeing around the issue of obesity with teen girls, perhaps they should be reminded of the health problems associated with eating too little and eating too much. Both which can result in death. Yes, use the word 'death'. Being obese or anorexic limits choices of boyfriends as well. It means you will only be dated by men who need you for money or a greencard. It also limits your choices of clothing. Too skinny and you'll have to buy your clothes at places that sell cloth pipe covers. Too fat, well, stores are selling clothes large enough to cover a car, but they will still be stuck with that loser boyfriend. Six simple words: "Put down the fork, lard bucket!" I would think starting kids of by breastfeeding them would be the FIRST step to a healthy emotional / physical bond that also encourages healthy eating habits/portion control. Yeah, right. And 30 years ago it was the "cold" mother who was responsible for autism. Of course, childhood and adolescent obesity has nothing to do with diet and lack of exercise. Couldn't possibly be related to all those over-hyped sweet soft drinks, fast food outlets, and sedentary electronic toys, and the end of outdoor recess programs in schools. From what I heard on the news, it sounds like they looked at those who were already obese, and did not look at a list of people who had bad relationships with their mothers and see how many of them were overweight. They could also look at a list of those who were thin and see how many had bonded with their mothers. They should do that. They've known depression can cause either weight loss or weight GAIN for years. Depression is mostly an energy problem, not having the energy to do anything. People suffering sever depression cant even get out of bed let alone jog. Perhaps people who had bad relationships with their mothers are more likely to suffer depression– even low levels of it. The cure all make me happy fix? One double cheeseburger please! Yes food releases endorphins, (especially fatty sugar filled foods) just like cigarettes or drugs. A natural but very temporary way to lift ones mood. Of course being called a fatty makes them depressed again, and its a never ending cycle. This is a looks like correlation rather than causation, a sample of 241 isn't proof of much in my opinion. Depression, addiction, codependency, life-style choices, and hundreds of other factors are at play here. At least this article is blaming the right person. Childhood/teenhood obesity is caused by mothers not caring what they put into their kids' mouths. If the mothers care enough to feed them healthy foods and encourage physical acticity, THEN they will be less likely to be obese teens or teens with eating disorders. IF YOUR CHILD IS OBESE, IT'S YOUR FAULT. DON'T TAKE THEM TO MICKY Ds. MAKE THEM PLAY A SPORT/DANCE, WHATEVER. In my view it simply has a lot more to do with amount of exercise and quality of food intake! I'm not obese, and my parents, neither of them had a secure relationship with my sister and I! We were abused! But looking at my younger siblings, they were spoiled! and now to this day they are the ones who are somewhat obese. my opinion is that weather or not they don’t have a secure relationship, is that the teenager is old enough to take care of him/herself own body. neither of my parents had a secure relationship with me, they weren't there when I was growing up, but that didn't lead me to obesity, because I still had respect for my body. My mom and me always bond together, not too long ago we've decided to lose weight. We are using RocaLabs Formula to help us lose more than 50 lbs, we exercise together and eat healthy together. Losing weight ++ bonding time is absolutely great.